Première partie. Le numérique, source d’innovations méthodologiques pour analyser la mobilité ? 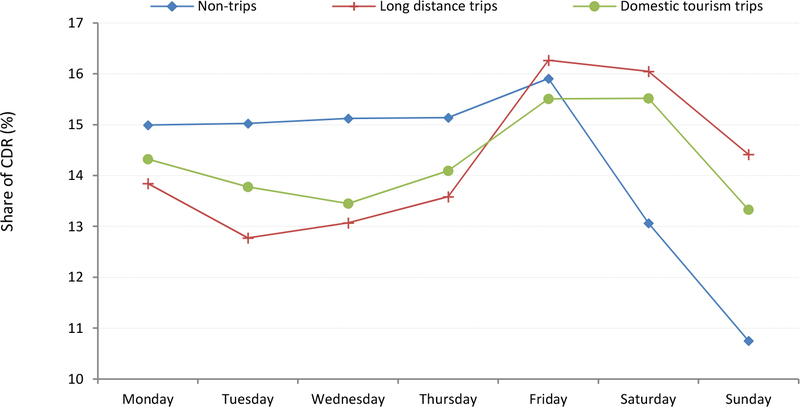 In this work, we discuss how an existing algorithm to extract long-distance trips from mobile phone data (Janzen et al., 2016 a,b) can be supplemented with man-made heuristics to arrive at plausible domestic tourism trips. In total, we detect 18,380 domestic tourism trips from mobile phone data of 69,000 users sampled in 32 cities in France. By analysing temporal, spatial and social characteristics of the domestic tourism trips, we explore several possible directions for the use of mobile phone data when studying domestic tourism on a large scale. We show how temporal patterns of mobile phone use differ from baseline behaviour, how destinations of trips can algorithmically be derived, and how future research can integrate information on the activation of the social network. Our main contribution is that we describe current barriers and sketch direction for future research. Nous discutons ici comment un algorithme d’extraction des trajets longue distance à partir de données de téléphonie mobile (Janzen et al., 2016 a,b) peut être complété par des heuristiques spécifiques afin de détecter des déplacements touristiques. Au total, nous avons détecté 18 380 voyages de tourisme interne à partir de données de 69 000 utilisateurs du mobile échantillonnés dans 32 villes françaises. En analysant les caractéristiques temporelles, spatiales et sociales de ces voyages, nous montrons comment les usages du téléphone mobile lors de ces déplacements diffèrent du comportement ordinaire, comment les destinations de voyages peuvent être dérivées algorithmiquement et comment l’information sur l’activation du réseau social pourrait être intégrée à la recherche future. L’objectif principal de ce travail est d’esquisser quelques directions possibles de l’utilisation des données collectées automatiquement par les opérateurs de télécommunication dans l’étude du tourisme interne à grande échelle. Do people call/texts more during domestic tourism trips? Do people have another weekly pattern of calling during domestic tourism trips ? Do people have a different hourly pattern of calling during domestic tourism trips ? 1The introduction of modern communication technologies has reshaped the experience of domestic tourism by altering the relationship between actors, space, environment, and institutions. Constant connectedness and the rise of image sharing, for example, have added a dimension of tourism as a broadcast service for the social network. Simultaneously, advanced information seeking and open reviewing have pushed many places and services into fierce competition for online reputation (Beuscart et al., 2016) and social sharing applications, whether in terms of information, cooking skills, a lift or even your apartment, are putting pressure on the canonical, well-guided tourism narrative that has been constructed over decades by large-scale institutions and small-scale actors alike (Guttentag, 2015; Orlikowski and Scott, 2014). 2The digital traces left by the daily use of technologies hold valuable information that is capable of leveraging knowledge far beyond the human-technology interaction (Giannotti et al., 2012). In other words, footprints of technology use are not only capable of describing how we use technology ; they inform a larger view on how we as humans activate our social network, expand our monetary welfare, move through space, or even lose weight. Even though such information at the individual level often consists of very little context and content, gathered at a large scale it reveals insights on the ever-changing nature of human behaviour and its relation to technology, social constructs, and direct environments including objects. 3In this paper, we explore what empirical insights mobile phone data can offer when studying these relations for a specific case of mobility : domestic tourism. We first discuss how an existing algorithm to extract long-distance trips from mobile phone data can be supplemented with man-made heuristics to arrive at plausible domestic tourism trips for thousands of users. In a second phase, we investigate the temporal, spatial and social characteristics of mobile phone use during the obtained domestic tourism trips. Given that no ground-truth is available, our analysis, interpretation and discussion offer an approval of our methodology to extract plausible domestic tourism trips. Our explorations are experimental, meaning that they do not offer fully developed applications. As such, we refrain from validation or comparison with literature. Rather we sketch possible directions to study different aspects of domestic tourism with mobile phone data, while carefully documenting the different constraints. 4Tourism, nowadays, forms an important part of contemporary lifestyle. It, consequently, has become a focus of policy especially because its concentrated nature (the displacements of large shares of the population to a limited number of destinations) has a large effect on the natural environment (pollution, destruction of ecosystems, congestion, etc.) (Burak et al., 2004; Holden, 2016), as well as on local economic development (World Travel and Tourism Council, 2016). In France during 2015, for example, the contribution of the tourism industry to the total GDP was 9.1%, the 6th highest ranking in the world (Kuusik, 2011; Nielsen, 2011). 5As important as impact of tourism trips might be, one interesting characteristic of contemporary tourism is the kaleidoscope of forms it is taking on. Under the influence of an increasing flexibility at the demand side (e.g., changing leisure time, development of long weekends, intertwining of work and professional trips), ever enlarging opportunities at the offer side (e.g. improving connectivity, increasing segmentation), and information technologies supporting the connection between both (Cánoves et al., 2004; Cohen et al., 2015; den Hoed and Russo, 2017), this development has been so prominent it can almost be caricaturised. Where tourism trips before consisted of a one, maybe two, week family trip to a well-known holiday destination, nowadays it can be anything from a short event-based trip with a sleep-over at friends, over a countryside-hitchhike based on (online organised) home-sharing, to the combination of work- and city trip in a conference centre. 6Sociological theory has not (at all) been insensitive to this development. Where tourism before was often theorized as an experience of mobility fabricated by the tourism industry around the idea of sightseeing, current paradigms, like the well-known ‘new mobilities’ paradigm (Sheller and Urry, 2006), suggest tourism practices to be heavily embedded in everyday contexts (den Hoed and Russo, 2017). One example of this, is in the way ‘mobile lifestyles’ have been blurring boundaries between leisure and work (Cohen et al., 2015). Another one is the way in which second homes and ‘neo-rurals’ are transforming rural tourism to a thematic, consumable commodity for the urban population (Cánoves et al., 2004). 7Traditional data collection methods for large populations, like national surveys, have allowed to capture some of the typical aspects of contemporary tourism. Eurostat, for instance estimates that in Europe, the number of personal trips has gone up by around 10% in the period between 2005 and 2015, but the average duration of these trips declined by 10% (Eurostat, 2017). For the case of domestic tourism trips, as can be seen in table 1, around two third of stays performed by EU residents in 2015 had a duration between 1 and 3 nights. This share is a bit lower in France, but still denotes an important aspect of contemporary (domestic) tourism to be rather short, especially given that domestic tourism makes up for a large share of all trips (78.4 % in Europe, 88.1 % in France). In terms of purpose, domestic tourism in the France anno 2015, showed high shares for holidays and visiting friends/relatives ; with longer stays having a higher share of holidays and shorter stays having a higher share of visits. The high number of friend and relative visits (50 % for all durations), certainly underscores the previously discussed idea of mobility being well embedded in everyday contexts. Remark that for the purpose-duration crossover, no further categories were available in the Eurostat data explorer. EU-28 is an aggregation for all 28 EU countries. Own adaptation, Source: Eurostat (2017) ‘Tourism trips of Europeans’. 8Still, the broad development of tourism, both as a practice and a theoretical concept, has as a practical consequence that the traditional ways of collecting empirical data are becoming increasingly insufficient. Bel et al. (2014), for instance, argue for the case of rural tourism that nation-wide surveys have been failing to select homogenous criteria to delineate ‘tourist’ from other travellers. Simultaneously, research exploring the behavioural approach, collecting and investigating variables such as activities undertaken or frequency of visits, ‘almost all are based on ad-hoc surveys concerning a single site’ (Bel et al., 2014). Similarly, Silm and Ahas (2010) show how traditional data sources do not enable to measure short-term, seasonal migrations even though non-traditional data sources estimate around 5% of the Estonian population to seasonally change its place of residence (Silm and Ahas, 2010). 9As a reaction researchers have been exploring different types of ICT-based tracking methods, mostly with the goal of reconstructing the spatial-temporal movements of large number of tourists (Shoval and Ahas, 2016). To track movement, GPS-data is most often used (Grinberger et al., 2014; Hallo et al., 2012; Nielsen, 2011; Pettersson and Zillinger, 2011) but mobile phone data, social network data, Bluetooth, radio frequency identification systems and geographically referenced photos can also be used to understand and qualify tourism patterns (Girardin et al., 2008; Hawelka et al., 2014; Nielsen, 2011; Spek, 2008). 10In this paper, we focus on ICT-based tracking by mobile phone, more specifically on CDR (Call Detail Record) data.CDR data have been used in (tourism) research for a decade now. Deployment of CDR data has been successful in distinguishing tourism destinations (Raun et al., 2016), deriving seasonality of foreign tourists’ space consumption (Ahas et al., 2007), evaluating travel distances of events visitors and regular visitors (Nilbe et al., 2014) and in segmenting repeat visitors (Kuusik, 2011). Although findings based on mobile phone data are collected at a much larger scale and treated in a more quantitative framework, they tend to accord well with findings from surveys and questionnaires. One interesting observation is that, typically, CDR data shows higher numbers in terms of call activities, present population, or undertaken trips than can be found in official statistics. Examples of this can, for example, be found in Ahas et al. (2008) or in Janzen et al. (2016a). 11Concerning the study of tourism destinations based on mobile phone data, Raun et al. (2016) notice that the concept of tourism destinations has been theorized in many ways (economic, socio-cultural, ideographic, organisational, cognitive, etc.). And although many of these studies highlight the importance of empirical research for their destination concept, very little empirically work has been done in this direction, and certainly not on a nation-wide scale. On a side note, we cannot but notice that a similar observation can be for research investigating the use of ICT in tourism. Here too, there has been several theoretical considerations on the matter (e.g. Lalicic and Weismayer, 2016) but large-scale empirical research is difficult to come by. 12As a first step towards measuring aspects of tourism destinations, Raun et al. (2016) define five dimensions of a destination - spatial, temporal, compositional, social and dynamic – and show how at least the first three can be quantified by CDR data. Concerning the actual detection of a single (or multiple) destination(s) for individual tourism trips, however, their analysis remains rather vague, using only measures of user presence at a larger statistical resolution (county level in Estonia). 13At first glance, this seems to be a study design choice, rather than a technical inability as literature has shown before that it is perfectly feasible to extract ‘meaningful places’ of everyday life from CDR data (Ahas et al., 2010). Investigating further, however, it becomes clear that it is not trivial to translate from methods that extract meaningful places for everyday life to the detection of destination(s) in tourism trips. Smaller observation periods, less collected data, less validation possibilities and a far higher heterogeneity of human space-time paths all pose challenges that are not easily to overcome. Specifically for the case of detecting destinations for domestic tourism, an extra difficulty lies in distinguishing domestic tourism trips from other activities based on CDR data only (as almost no cross-over with other datasets is allowed due to privacy regulations). This compared to the study of foreign tourists CDR users with a foreign sim card can be assumed to be on a tourism trip. To the best of our knowledge, no works in literature exists on how to extract, let alone validate, domestic tourism trips from CDR datasets, nor has there been work investigating the possibilities to detect destinations from such domestic tourism trips. 14Ultimately, it is interesting to observe that Raun et al. (2016) mention the possibility to use mobile phone data to measure the ‘social dimension of tourism destinations’. Certainly, this social dimensions forms an important part of the new mobilities paradigm to study tourism, or as Larsen states: “the analysis of obligations, social networks at a distance and social capital should be central to 21st century tourism analysis” (Larsen et al. 2007, p. 259 also cited in Raun et al. 2016, p. 205). And it sterns no doubt that mobile phone data is capable of quantifying several aspects of social networks at a large scale simply by reconstructing the call networks obtained from mobile phone use (Blondel et al., 2010; Grauwin et al., 2017). 15The current gap in literature is that, despite an emerging field on the relation between human mobility and encounter networks (Riascos and Mateos, 2017), and despite several works in literature elaborating the general relation between social networks and mobility as based on mobile phone data (Deville et al., 2016; Phithakkitnukoon et al., 2012; Toole et al., 2015), no work has yet been undertaken to transfer and elaborate these insights to the case of (domestic) tourism. Probably because of the difficulties to i) extract long-distance trips from CDR data, ii) define tourism trips from these long-distance trips iii) uncover a single (or multiple) destinations for these tourism trips, and iv) most importantly, the difficulty to properly validate the previous three steps at a large scale. 16The first of these difficulties has recently been addressed by Janzen et al. (2016a), the second and the third form the main body of this paper, whereas the overarching last problem is left unsolved. The latter, as mentioned before, makes our work mainly experimental with as goal to describe the barriers and show the potential to apply mobile phone data to the study of domestic tourism. 17Active mobile positioning is “mobile tracing in which the location of the mobile phone is determined (asked) with a special query using a radio wave. In order to ask the location of certain phones, a special environment and permit from the phone holder is required” (Ahas et al., 2008, p. 470). 18On the other hand, passive mobile positioning data is automatically stored in log files of mobile operators, mostly for billing purposes. Such logs, which are often in the format of a Call Detail Record (CDR), are only created for actions initiated by the user at the operator’s cell tower (Ahas et al., 2008; Kuusik, 2011). In other words, A CDR record is a trace created when a mobile phone user makes a call (or text) and typically consists of an anonymous (but consistent) ID of the caller and called person, the duration of the call, the time of the call event, the identifiers of the cell tower to which the user was connected (which can be linked to the exact geographical location of the cell tower) and the type of activity (call or text message). Table 2 shows an example of a CDR. 19Using CDR data to reconstruct individual mobility pattern offers several advantages compared to other ICT tracking methods, surveys or questionnaires. 20For starters, mobile phone data is available over long time periods and covers large study areas with rather high spatial resolution. In addition, penetration rates of mobile phones are high (estimated 86% for 2007 (ARCEP, 2008)), rendering really large samples of populations. As a consequence, work on various time and spatial scales can be done for large shares of the population, opening up unseen applications in many areas (Deville et al., 2014; Järv et al., 2014; Nielsen, 2011; World Bank, 2013). For example, aggregating data over extended periods of time enables complex analysis and diminishes the influence of singular events and/or non-routine behaviour, which offers opportunities to investigate specific activities compared to baseline behaviour (Vanhoof et al., n.d.). 21Compared to accommodation surveys and questionnaires, CDR data is less biased as surveys and questionnaires can lead to respondent fatigue. In addition, gathering CDR data for large samples is much more cost-effective, among others because the CDR data storage happens automatically (Axhausen et al., 2007; Golob and Meurs, 1986; Järv et al., 2014). Compared to other mobile sensing applications, like GPS tracking, CDR data has the advantage of not requiring active participation of users for the activation of tracking, or by consenting to sharing their exact location data, which for many means a burden or raises privacy concerns (Chen et al., 2010). 22The most important characteristic of CDR data, however, is that, in addition to movement data, it also stores logs of interactions between people (who calls whom). This way, direct links between human interaction and human movement can be investigated and exploited, even though this is not yet common practice in literature (Toole et al., 2015). 23The biggest disadvantages of CDR data are the temporal scarcity in observations (in 2007, on average, around 4 records per user per day were collected but the actual numbers differ between users depending on the individual usage) and the spatially inhomogeneous distributions of covered areas, which results from a demand-driven, non-uniform distribution of cell tower locations (more cell towers in densely populated areas). Both disadvantages pose substantial challenges for the automated (spatial) analysis of CDR data and makes inferring information at the individual level much more complicated compared to other sources like, for instance, GPS data (Vanhoof et al., n.d.). 24In this paper, we use access to an anonymized CDR dataset recorded by Orange. The data covers mobile phone usage of ~18 million subscribers on the Orange network in France during a period of 154 consecutive days in 2007 (May 13, 2007 to October 14, 2007). Mobile phone penetration being estimated at 86% (ARCEP, 2008) at that time and given a population of 63,945 million inhabitants during the observed period1, that is a rough 32% of all French mobile phone carriers and 28% of the total population. 25The Orange France 2007 CDR dataset is one of the largest CDR datasets available worldwide in terms of population-wide coverage and has been extensively studied (Deville et al., 2014; Grauwin et al., 2015; Sobolevsky et al., 2013). It is the latest CDR dataset available for France that allows for a long term, continuous tracking of individual users in France. More recent datasets are limited by The French Data Protection Agency (CNIL) in anticipation of the EU General Data Protection Regulation and do not allow to collect individual traces during longer time periods as they are considered risky even if personal identification information is irreversibly recoded. 26One can define domestic tourism as: “tourism of inhabitants of a certain country that only takes place within the borders of that country, but outside their usual environment” (UNWTO, 2008), and oppose it to abroad or international tourism, which is tourism where “the destination is located outside the country of residence” (UNWTO, 2008). This opposition holds, as domestic and abroad tourism are considered substitutes, meaning that actors are more likely to choose for either domestic or abroad tourism than for a combination of both (Eugenio-Martin and Campos-Soria, 2011). 27For France, domestic tourism forms a large share of overall tourism or thus a relevant ‘type’ of tourism to study. During 2013, around 89% of all tourism trips departing from France were considered domestic trips, which is a rather high share compared to other countries in the OECD (Organisation for Economic Co-operation and Development) region (Eurostat, 2015, 2017). 28In terms of mobility, (Hall, 2005) argues that tourism mobility should be viewed in a space-time perspective to allow for distinction between different types of (tourism) mobility. 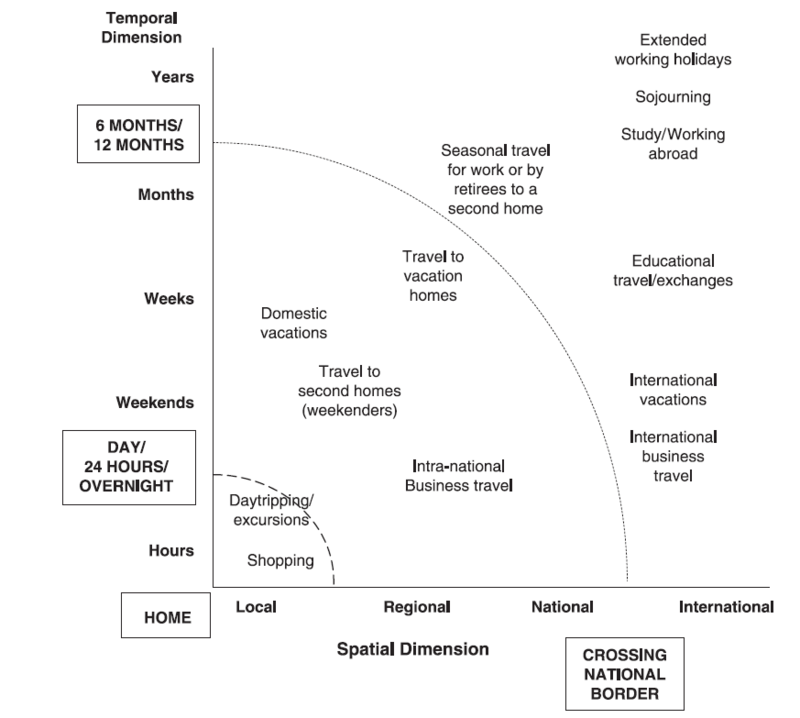 Figure 1, for example positions domestic vacations(/trips) within the temporal scales of weeks and on the regional-national level. Behaving at similar time and space ranges, other forms of tourism like business trips or short stays at second homes can be distinguished indicating that, of course, time-space is only one possible discriminant between different forms of mobility and tourism. Source: Bell and Ward, 2000; Hall, 2003, 2005. 29In order to derive domestic tourism trips, the information available in CDR datasets needs several steps of processing. In the next paragraphs, we explain the different steps and interpretations made to obtain domestic tourism trips from raw CDR data. 30Following the definition, domestic trips can be defined as movements outside user’s usual environments though still inside the national borders. In our case, the latter restriction is automatically fulfilled thanks to our national dataset. Concerning the former restriction, Janzen et al. (2016a) elaborate a methodology to extract long-distance trips from CDR data. They use the home-anchor model by Ahas et al. (2010) to define a cell tower that represents home for each user. The usual environment of a user then is constructed as an 80 km radius from that cell tower, as proposed by the French National Travel Survey (ENTD2). 31A long-distance trip, hence, consists of a series of CDR observations in which an individual user leaves his usual environment for an undefined time period before returning to it. 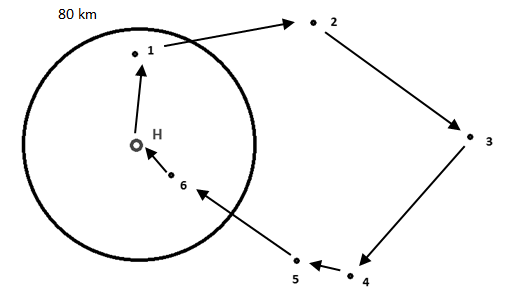 Figure 2 gives a schematic representation of a long-distance trip as derived by the methodology of (Janzen et al., 2016a). The home location (H) is defined by the anchor model from Ahas et al. (2010) and forms the center of a usual environment that is within a radius of 80 km. The different numbers represent the sequence of CDR observations collected in the trip with the first and the last point of the trip being situated in the usual environment. 32Applying their methodology to the same French CDR dataset as this paper and after comparing results to the ENTD-survey, Janzen et al. (2016b) conclude that national surveys heavily underestimate the amount of persons that perform long distance trips, as well as the amount of long distance trips per person. The analysis of 1.4 million French mobile phone users during a one month period in June 2007, showed 58,7% of French users to perform long-distance trips (compared to 25.7% in the ENTD survey), with an average of almost 2 long-distance trips per user. H indicates the detected home location and numbers the different cell towers for which CDRs are stored. 33The main reasons the observed difference between survey and CDR data are i) survey respondents underestimating their number of long-distance tours, probably related to memory effects (e.g. Axhausen et al., 2007) and ii) a number of so called ‘soft refusals’ implicated by quite a larger portion of respondents in surveys that do not report any long-distance tours at all, whereas based on mobile phone data one would expect otherwise (Janzen et al., 2016a). 34Being capable of extracting long-distance trips from CDR data we ask ourselves the question whether we can construct a logic to derive domestic tourism trips from long-distance trips. 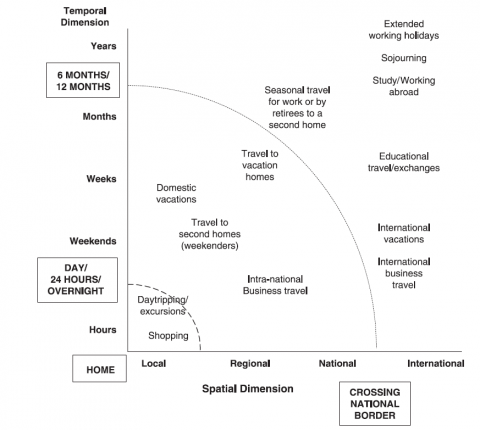 Based on figure 1, we reckon that filtering long-distance trips based on their duration offers the possibility to exclude trips that are either too short (some days, a weekend) and thus rather fall in the category of excursions, weekends, shopping or business trips, or too long (several months) and thus can rather be considered trips to second homes, studies abroad, seasonal travel, etc. 35In addition, we want to make sure that we exclude as much as possible, trips that would relate to professional purposes, compared to personal purposes which are in our main interest here. To filter out trips with a professional purpose, the ENTD survey for France offers guidance. As can be seen in table 3, the number of trips for professional purposes during the summer of 2007 was estimated rather low (12.5% for July and only 5.6% for August) compared to the other months so we decided on working with these months only. 36Additionally, as can be observed in table 1, limiting the duration of the trip also impacts the share of trips with professional purpose. As the source data for table 1 did not offer a crossover of duration and purpose for all trips longer than 4 days, we assumed a duration of 8-15 days to be a safe choice given that, this way, the inclusion of a full weekend in the trip was ensured. It should be noted, however, that in contemporary tourism practices professional and personal (touristic) activities are increasingly overlapping, making a differentiation increasingly difficult (Den Hoed & Russo, 2017 ; Larsen et al., 2007). ENTD, own adaptation. Source: IFSTTAR, 2016. 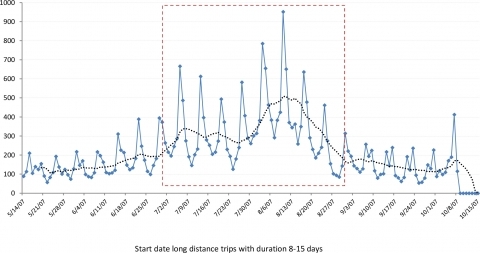 38In order to i) ensure that at least one full week(end) took place within the trip, ii) avoid inference with longer stays as they might influence the monthly-based home detection algorithms to extract long-distance trips (see Janzen et al., 2016a) and iii) exclude, as much as possible, the occurrence of professional trips which are observed more for trips with shorter duration (see also Table 1). 39Given the high time cost of our analysis, we randomly sample users with a supposed home location in one of the 33 most populated cities in France. We decided to omit Strasbourg from this list because of its closeness to the German border, often resulting in incomplete CDR for users in this area. 40We also omited users that do not have a consistent home location when applying the methodology by Ahas et al. (2010) for each month in the dataset. Afterwards, we selected 2000 users per city, except for Paris, where we selected 5000. Our sample selection resulted in a subset of CDR data with activities of 69 000 randomly chosen users. 41Based on the methodology proposed by Janzen et al. (2016a) in section 4.2.1 we extract all long-distance trips for the 69,000 users in our CDR subset. In total, we found that during a period of 156 consecutive days, 491,226 long distance trips were performed by 65,759 distinct users, which averages to about 7.5 trips per person. The distribution of start dates for all long-distance trips during the 5-month period is given in figure 3. There is a clear weekly pattern with higher amounts of long-distance trips starting on Friday and Saturday and the lowest amounts of long-distance trips starting on Sunday (for the months June and July), or on Wednesdays (for the months August and September). Special holidays such as Ascension (Thursday, 17th of May) or Maria Ascension (Wednesday 15th of August) are preceded by peaks in starting long-distance trips. Notice that the 14th of July, the French national holiday, took place on a Saturday in 2007 and hence goes rather unnoticed. 42Remarkably, as indicated by the 7-day moving average in figure 3, the number of long-distance trips goes down during July and August. This might seem counterintuitive (given that they are the main holiday months) but is actually logical when one remembers that the detection of long-distance trips bases on leaving the usual environment. Therefore, long-distance trips with short durations are very well presented in the dataset (as can also be observed in figure 4). As a consequence, when more long duration trips are performed, the occurrence of short duration trips drops, resulting in lower total amount of long distance trips observed in July and August. The dotted line indicates the 7-day moving average window. 43As discussed in section 4.2.2, we filter long-distance trips on their duration to obtain domestic tourism trips. 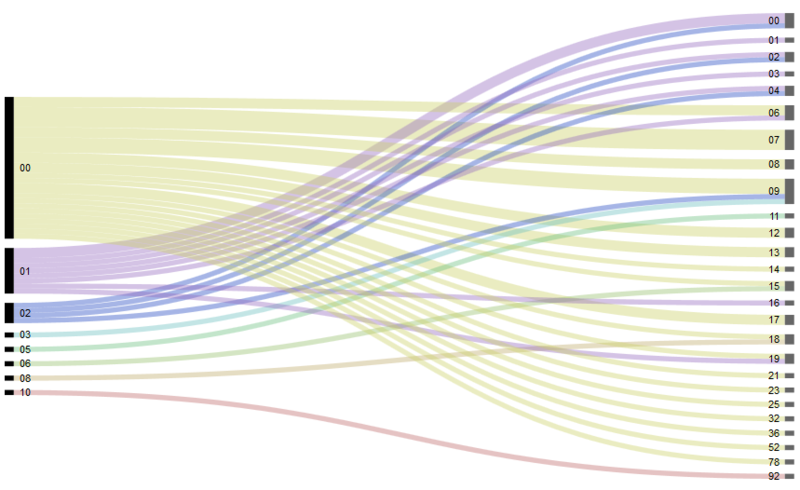 Figure 4 shows the distribution of the duration of all 491,226 long-distance trips performed by the 69,000 users in our selection. Bounding the duration of long-distance trips to be between 8 and 15 days, limits the number of trips to 34,633 (or 7 %), performed by 25,488 distinct users. The found 7% share is relatively similar to the share of tourism trips observed by census data, where trips with duration 8-15 days for 2012 and 2015 make up around 11% of the total (see table 1). Differences may be due to differences in the years of observation (2007 versus 2012 and 2015) and in the months of observation (July-August versus the entire year). 44Interestingly, as can be observed in figure 5, the distribution of start dates for long-distance trips with duration between 8 and 15 days reveals a different pattern compared to the long-distance trips with other durations. The most apparent start dates for trips during 8-15 days are in July and August, with a clear higher share during the first couple of weeks in August and the first weeks of July. It is reassuring that these are exactly the same periods we will use further on to arrive at domestic tourism trips. The dashed box indicates the part of the data that will be annotated domestic tourism trips. The dotted line indicates the 7-day moving average window. Note that trips at the end of time-series could not be detected less than 7 days before the end of the observation period. The peak on 07-10 is also a relic of our methodology as it captures all trips having a duration between 8 and 15 days from that date onwards. The dashed box indicates the part of the data that will be annotated domestic tourism trips. 45Similar to the long-distance trips with other durations, there is a clear preference to start long-distance trips with duration between 8 and 15 days on Friday or Saturday. However, during non-tourism season (May, June, September, October) differences between Friday and Saturday diminish and there is a clear upswing in the number of trips starting on Sunday. This is especially true for September, where start dates on Sunday become prevalent and might, hypothetically, be due to different types of trips like, for instance business trips or travel to places of study. 46Remember that we defined domestic tourism trips to be long-distance trips with duration between 8 and 15 days and occurring in July or August. We added the July and August restriction because of the lower share of professional trips made during this period according to the ENTD survey as well as according to Eurostat numbers (Eurostat, 2017). Applying both restrictions, our dataset limits to a total of 18 380 trips performed by 16 024 distinct users which we call domestic tourism trips and on which we will focus on in the rest of this paper. 47By means of recapitulation, table4 provides a short overview of the different pre-processing steps we undertook to arrive at the dataset of domestic tourism trips. Figure 6 frames the total amount of CDR data (with a unit being one CDR) available for all users that are not in a trip, on a long-distance trip, or on a domestic tourism trip. The CDR data from domestic tourism trips will be used in the pursuit of this paper. Remark that for the category long-distance trips, domestic tourism trips are not included. 48Possessing a CDR dataset of 18 380 presumable domestic tourism trips we can investigate different properties of the digital traces left by mobile phone use during these domestic tourism trips. In the next paragraphs, our analysis will explore temporal, spatial and social aspects of the available CDR data. As such we try to provide both an indirect validation of the proposed logic to derive domestic tourism trips (given that no ground-truth data is available) and inspiration for future, more in-depth work. 49A first question we ask ourselves is whether patterns of mobile phone use change, or not, during domestic tourism trips. As such, we investigate whether people during domestic tourism trips i) call/text more, ii) have a different weekly time pattern, and iii) have a different hourly time pattern. The remarkable peak of activity at the 20th of June coincides with the annual, nation-wide celebration of “la Fête de la Musique”. 50Figure 7 shows the average amount of calls/text per person for 69,000 users in our selection that are considered to be either not doing a long-distance trip, doing a long-distance trip (excluding domestic tourism trips) or doing a domestic tourism trip. Interestingly, for all categories the average amount of calls and texts per person decreases during summer months. Absolute numbers, however, are clearly lower during long-distance trips and especially domestic tourism trips, resulting in the conclusion that people tend to communicate less when performing long-distance mobility. 51Figure 7 also shows that the typical week pattern of mobile phone use is not sustained by users performing long-distance or domestic tourism trips. Probably, baseline mobile phone use is influenced by professional activity, resulting in high and constant mobile phone use during the weekday and more limited use during weekends. 52Figure 8 shows that the inverse is true for long-distance and domestic tourism trips. Here, share of mobile phone use is lower during ‘working’ days and peaks in the weekend, suggesting the more leisurely context of these mobilities. Remark that the higher shares of mobile phone use in weekends for the long-distance trips is influenced by an over-representation of short-term trips, often occurring during the weekend, like for example city-trips, shopping, family visits etc. Such overrepresentation, however, does not occur for domestic tourism trips as they are defined to be between 8 and 15 consecutive days. Therefore, our suggestion that the concentration of mobile phone activity during weekend probably indicates a difference in use of time is more rigid for what we define as domestic tourism trips, than it is for long-distance trips. 53Similar to the weekly pattern in figure 8, figure 9 shows the hourly pattern of mobile phone use for the different mobilities. 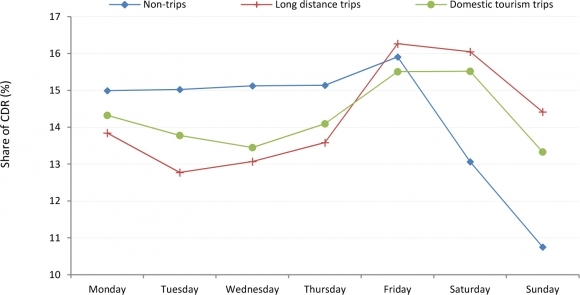 Interestingly, in terms of hourly patterns, mobile phone use during long-distance trips tends to accord rather well with baseline behaviour, whereas the hourly pattern of domestic tourism trips is clearly different. Specifically, phone activity during domestic tourism trips has a larger share during evenings and nights (between 20:00 and 06:00 hours). On the contrary (or should we say complementary) activity is lower in the morning (7:00 to 10:00 hours) and the afternoon (16:00 to 19:30 hours). The lack of communication during early morning and late afternoon seems to be balanced out by a higher share of activities between 10:30 and 12:00 hours. 54Again, our empirical findings form a signal for a different experience or organisation of time during domestic tourism trips, which is credible but needs to be complemented with future research efforts to be correctly understood within its context. Obviously, one plausible interpretation can be in terms of leisurely activities that are performed during domestic tourism trips and that, typically, take place at later hours of the day. 55A second question to explore is whether we can estimate the destination of a domestic tourism trip based one the available CDR data. To tackle this question, we present the Duration and Calls Ratio (DCR) algorithm. In the next sections, we discuss its construction, its sensitivity to parameter choice, and its performance based on expert validation. This way, we try to assess the feasibility of detecting destination of domestic tourism trips from CDR data. The application of DCR algorithm to our database results in an empirical estimation of the domestic tourism flows in France departing from 32 cities during the summer of 2007. 56To construct a destination detection algorithm operating on CDR data of domestic tourism trips, we tested several heuristics including, but not exclusively : furthest distance from home location, highest amount of calls, and the highest amount of calls during restricted periods (like nights). Ultimately, we decided to use the combination of amount of calls and the amount of distinct days to detect a destination from CDR data. Specifically, the Duration and Call’s Ratio (DCR) algorithm defines the destination of a domestic tourism trip to be the cell tower with the highest ratio of mobile phone activity and the highest ratio of amount of active distinct days during the entire period of the domestic tourism trip. 57As an example, imagine the pattern of one domestic tourism trip as shown in figure 10. Counting the amount of mobile phone activities and the amount of active distinct days per cell tower creates the necessary input for the DCR. In the example of figure 10, a call ratio of 0.58 (15/26) and a duration ratio of 0.9 (9/10) satisfy an a-priori defined requirement to address the cell tower indicated in red as the destination of the trip. 58Obviously, the annotation of a cell tower as destination of the trip is dependent on the requirements set by the distinct days and call ratio in the DCR algorithm. In this section, we assess the sensitivity of the amount of detected destinations to parameter choice. In the next section, we perform expert validation to assess the performance of the algorithm for different parameter combinations. A long-distance trip is represented by the number of distinct days and the number of calls performed at each cell tower (dots). The cell tower in the right bottom corner is detected as destination. Remark that although information is displayed in 2-D, the algorithm does not take into account spatial information. 59The amount of detected destinations is sensitive to parameter choice in two ways. As the chosen parameters set a lower bound for cell towers to be eligible as destination, severing or loosening the lower bounds will result in lower or higher shares of trips with detected destinations. Secondly, changing the parameters also influences the amount of eligible cell towers per trip. Having multiple eligible cell towers introduces an uncertainty and ambiguity that, without ground-truth, is difficult to assess. In that case, the algorithm will pick the cell tower fulfilling the strictest requirements. 60To investigate sensitivity to parameter choice, Table 5 and Table 6 show the percentage of the 18,380 domestic tourism trips that have respectively one, or several cell towers that fulfil the parameter restriction. Clearly, loosening parameter requirements results in larger shares of domestic trips that have one detected destinations, but also results in larger shares of domestic tourism trips possessing multiple plausible destinations. Interestingly, there is a local optimum for single destination detection (call ratio=0.3 and distinct-days ratio=0.1) but expert validation in the next section, will show it to have a lower performance (see Table 7). 61To assess the performance of the destination detection, expert validation was performed on 100 domestic tourism trips for each parameter combination of distinct days and call ratios. The expert was demanded to evaluate the same information as provided to the algorithm ; meaning that they received the location of the cell towers, the amount of calls made per cell-tower, the total amount of calls made during the trip, the distinct days the user was active on each cell-tower, the total amount of distinct days of the trip, and an indication on which cell-tower the DCR algorithm had chosen as its destination or an indication that the algorithm had not detected a destination. The expert then was asked to rate the algorithm’s decision with: agree, disagree or dubious, and this for both the cases in which the algorithm detected a destination and the cases in which no cell tower was deemed eligible (Hendrickx, 2016). 62In general, performance of the DCR algorithm is high for combinations that have stricter parameter restriction (at least one parameter >0.2). We found several well-performing parameter combinations all ranging between call ratio 0.1-0.2 and distinct-days ratio 0.2-0.5 (grey areas in Table 7). To better inform our decision, an additional validation of 400 cases was done on each of those combinations. The parameter combination 0.1 (call ratio) and 0.3 (distinct-day ratio) rendered the best performance with an agreement with the expert for 89% of the cases in which a destination was found and 94.4% for cases in which no cell tower was found eligible (see Table 7). As such, we decided to use this parameter combination during the rest of our analysis. Grey combinations were investigated for 500 cases, white combinations for 100. The dark grey case is the 0.1, 0.3 combination used in the rest of the analysis. 63Given that the long-distance trip detection provides for an assumed home location and the DCR algorithm for an assumed destination, we can easily construct and analyse domestic tourism flows. Figure 11 maps all home-destination pairs detected for our 18380 domestic trips given the call ratio= 0.1 and distinct day ratio=0.3 parameters. Popular destinations like the south and west coast, as well as mountainous areas and national parks are prominent. In addition, intercity travel can be observed to make up a small part of the domestic tourism trips, with, seemingly, the amounts of trips being inversely related with intercity distance as is also the case in the classical gravity model (Zipf, 1946). Lines are drawn between the presumed home location of the user and the detected destination of the trip. Colour saturation, opacity, and linewidth are dependent on the number of users performing the domestic tourism trips in order to highlight the general pattern. Lines are drawn for each domestic tourism trips between the presumed home location of the user and the detected destination of the trip. All lines have the same colour saturation, opacity and linewidth are equal for all lines. 64Focussing on specific destinations or origins of domestic tourism trips, as done in figure 12, allows observing and interpreting the spatial distribution of their associated domestic tourism trips. The west-coast, for example, attracts visitors from all 32 cities but the amount of observed flows is highest starting from the cities located in the central-west of the country (see figure 12a). Domestic tourism trips starting from Paris, as another example in figure 12b show destinations to be rather well-spread with a clear preference for coast areas and the alps, a neglect of the north-eastern regions, and limited interests for the Pyrenees. 65A third and last question that can be explored is how activation of the social network changes when user perform domestic tourism trips. Because CDR data store metadata on both identifiers of the contacting and contacted persons, it is possible to investigate such changes at the level of individual, egocentric networks. Given that we already know mobile phone communication to lower during domestic trips (see figure 7) the question now becomes whether social networks are activated differently, or not, during domestic tourism trips. 66Extracting social networks from CDR data has been widely deployed to study properties of human interactions (e.g. Phithakkitnukoon et al., 2012) even though they have only sparsely been linked with mobility characteristics (Toole et al., 2015). The most simple and microscopic social network that can be extracted from CDR data is an egocentric network, which summarizes the interaction between one user and its peers. In egocentric networks, nodes are thus the persons that have been contacted by a user, whereas the edges denote the amount of contact between two users (in this case, the amount of calls and texts). 68The values of entropy range between 0 and infinity (but have a practical upper bound around 2), with 1 indicating that a user distributes his/her activities equally over all contacts in such a way that each contact has the same number of activities as there are contacts. An entropy value nearing zero implies a user that focuses a large share of his/her activities on a small share of peers. 69Because degrees and entropy values can be calculated from CDR data for different periods, it is possible to investigate how they differ during different mobility phases. Table 8 offers an intuition of this idea. It shows the degree and the entropy for the egocentric network of one random user during his/her domestic tourism trips, long distance trips (excluding domestic tourism trips) and normal periods. Clearly, the amount of activities and degree are different for the different mobility phases because they have a different duration. Proper comparison therefore requires some normalization either against a duration (e.g. calls per day) or against baseline behaviour (e.g. calls per average amount of calls observed on a Sunday). 70The use of the entropy measure, is extremely interesting in this perspective as its calculation is independent from the magnitude of activities or contacts meaning it is less prone (if not independent) to the duration of observation and therefore needs no normalization for comparison. In addition, its interpretation as a diversity measure for activating the egocentric network forms an interesting piece of information when it comes to mobilities. In the case of the random user in Table 7, for example, a highly divers activation of the egocentric network is observed during non-trips period. In contrast, lower entropy values during long distance trips show the activation of the network to be less divers. The entropy values for the domestic tourism trip are situated somewhere in between, showing a diversification of the interactions in the egocentric network that is different from the other mobilities. 71Obviously, investigating the indicators for one user is not very informative, but it shows the opportunities of similar analysis for larger populations as a large-scale quantification, or even statistical analysis of differences in the social network activation during different mobilities for thousands of users becomes possible. Such analysis is feasible and would evoke the changing characteristics of egocentric networks throughout different mobility phases. 72Apart from shifts in the amount and diversity of activities in the egocentric networks during mobilities, a final intriguing question is how specific peers are contacted differently during different mobility phases, and whether we can derive a ‘role’ for these peers based on this information. For example, contacts that have been contacted only once or twice during a domestic tourism trips and never during a normal-work period might be categorized as ‘facilitators of the tourism trips’, rather than as ‘homebound friends’. 73Figure 13 shows an example of description that can help with this objective. 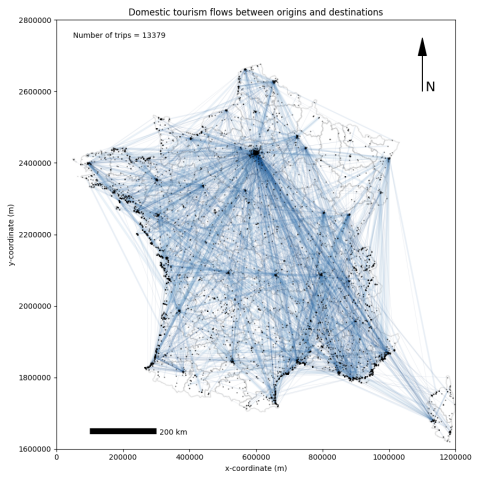 In the figure, we use the egocentric network of one user and relate the amount of activities made to each contact during a domestic tourism trip with the amount of calls that were made to the same contacts during the non-trip periods. Several interesting patterns can be observed from this visualization and building on them, it is not difficult to evoke the idea of attributing a certain ‘role’ to group of peers. 74For example, for the user in figure 14, the favorite contact has remained the same with 10 interactions during the domestic tourism trips and 92 during the non-trip period. This peer thus is a frequent contact, potentially even a spouse, a good friend or an important business contact. As a second example, peers that have been contacted several (>2) times during the domestic tourism period turn out to also be regular contacts during the non-trip period (with amount of interactions ranging from 9 to 78). It is interesting to note that these peers, although quite present during the domestic tourism trip do not make up for the highest amount of interactions in non-trip periods. This suggests a change in the use of the social network during mobilities, preferring certain peers over others, as can happen for example with work related contacts, friends, or contacts that were co-accompanying the user on the trip. 75Of course, the attribution of ‘roles’ in this example, is being based only on the mere amounts of interactions, but other aspects of communication ; like time of calls, duration of calls, etc., could be used to further develop this way of investigating the roles and dynamics of egocentric networks for different phases of mobility. As with the degree and entropy indicators, the example of one user is not very informative in itself but it shows to potential to extend the idea to large-scale populations. As for the example of in figure 13, such an extension would require a methodology that quantifies the dynamics of the roles as, for example, expressed in the slopes of the alluvial diagram. Automatizing such task, as well as interpreting roles in an egocentric network is challenging but should be feasible and would open an array of empirical observations on the role between social contacts and mobilities. The same user as in Table 8 was used. Each line unit represents one contact. To improve readability, users that have less than 5 calls in the non-trip period and 0 calls during the domestic trip period are not shown. 76Based on the presented results and our own experiences, we’d like to suggest three different lines for future research. 77Firstly, and above all, the need for ground truth data is fundamental for the further development of similar empirical research. The magnitude of digital traces that are rapidly becoming available for large populations will remain of limited use when no efforts for ground-truth data collection are made. Specifically, for CDR data, ground truth data on both the usage of mobile phones and the actual mobility patterns of individuals are paramount but lacking, hereby obstructing the further development of research. In absence of good validation data becoming available, the assessment of methodologies using CDR data leans upon a general willingness to either deploy high-level comparison with census data (e.g. Janzen et al., 2016a) or accept the common sense in deployed heuristics, even though both might not always align (e.g. Vanhoof et al., n.d.). As shown in this paper, heuristics might produce plausible results for example when it comes to interpreting long-distance trips as domestic tourism trips, or in detecting destinations from the latter, but future work should definitely be orientated towards validation of such results. 78Secondly, we would suggest future research to broaden the scale of the presented results. The current selection of 69,000 urban users has been deployed because of practical reasons but could, given current technologies, and should, for research reasons, be broadened. Extending user sampling to non-urban environments, for instance, might result in different results concerning time use, or the activation of social networks during mobility phases. Concerning the latter, the analysis of the egocentric network of one user offered an exciting start to investigate the largely unexplored relations between activation of the social network and (domestic tourism) mobility. Conditions to scale up such analysis are challenging, with parts of the analysis being computationally expensive and their interpretation far from generic (e.g. figure 13). In the future, however, this should not obstruct research to derive insights from combining the main dimensions of information in CDR: social activity and human mobility. 79Thirdly, we suggest future research to address the sensitivity, and thus sustainability, of methodologies deploying CDR data for changes in time periods and/or study area. Until now, the question remains on transferability of findings with the driver of uncertainty being the rapidly changing uses of ICT in general and mobile phones in particular, and thus the changing nature of the data collected. Longitudinal studies as well as research that compares between regions should, ultimately, form the cornerstone on which transferability of methodologies and insights can be build. In our case, the use of simple parameters to tune heuristics is both advantageous and disadvantageous in this perspective. Advantageous, in the sense that easy adaptability and a close feedback loop to the input data allow for flexibility in coping with the changing nature of digital traces or in transferring methodologies to other datasets. Disadvantageous because parameter choice remains subjective, and as such might not always render correct results (which again is difficult to assess when little to no validation data exists). Even though expert validation and sensitivity analysis offer guidance, it remains a challenging research question to see empirical research using heuristics to, for example, determine destination of domestic tourism trips, can be better objectified and still be applicable to different datasets at different times and in different regions. 80All of our suggestions form fundamental but extensive challenges to develop an empirical view on domestic tourism based on mobile phone data. Together with the, say, practical barriers carefully documented in this experimental study, the question hence becomes whether the benefits would outweigh the cost to overcome these challenges. In this perspective, it is important to stress that our explorations only touch very briefly on a limited amount of possibilities to use mobile phone data for studying domestic tourism. They by no means cover the potential benefits that could be obtained. But allow to imagine different future applications. 81Primarily such applications would allow monitoring contemporary tourism at a much larger-scale, to a much finer resolution and with relation to different aspects compared to currently available surveys (whether they’d be nation-wide or destination specific). Information on the destination of trips based on CDR data possibly augmented with insights on historical call patterns, for instance, could allow for a better understanding of the important ‘visiting friends and family’ share of domestic tourism. 82Another example could be insights on the use of mobile phones and the activation of the social network during different mobilities phase that allow to better understand the (diminishing) division between leisure and work during tourism trips. A third and final example could be CDR data enabling a better, long-term understanding of the relation between the development of urban areas, second-homes and the overall effects on rural tourism. 83Ultimately, these ideas might be a bit to envisioned and their eventual developments will definitely have their flaws, but the main idea stands that there is an opportunity to explore new aspects with regards to domestic tourism in mobile phone data, and that such an empirical approach is worth elaborating as it can help to both advance and anchor theoretical ideas. 84Concluding, we showed how a data-driven logic can be applied to mobile phone data in order to study different aspects of one specific type of mobility : domestic tourism trips. 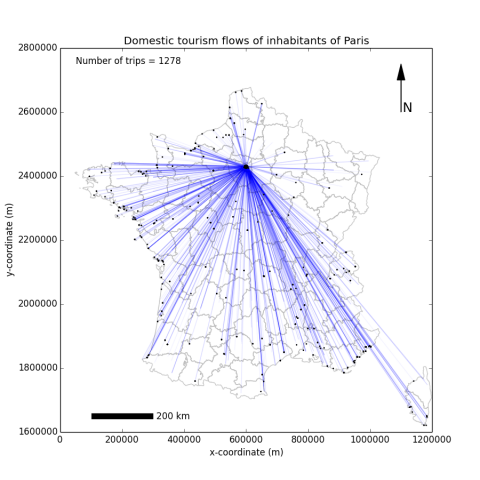 In total, we derived 18,380 domestic tourism trips from CDR data of 69,000 users sampled in 32 of the biggest cities of France. 85Our results showed how temporal aspects of domestic tourism trips differ from baseline day-to-day behaviour in ways that seem plausible and logical. Subsequently, we proposed the DCR algorithm to detect destinations of domestic tourism trips. Performing both a sensitivity analysis and expert validation led to an informed parameter choice, resulting in the construction of a spatial pattern of domestic tourism flows in France for a sample size that questionnaires and surveys cannot easily obtain. Ultimately, we showed how it is possible to investigate changes in social behaviour during domestic tourism trips and other mobilities based on CDR data by investigating properties of the egocentric communication network. 86Our efforts open up several potential directions for future empirical research on the ever-changing relation between human mobility, technology use, social interaction and the construction of time ; all of this based on the analysis of mobile phone use captured for large population samples. ARCEP (2008), Le Suivi des Indicateurs Mobiles - les chiffres au 31 décembre 2007 (publication le 4 février 2008) [WWW Document]. BLONDEL V., KRINGS G., THOMAS I. (2010), Regions and borders of mobile telephony in Belgium and in the Brussels metropolitan zone, Brussels Studies. EUROSTAT (2015), Tourism statistics – top destinations [WWW Document]. GOLOB T. F., MEURS H. (1986), “Biases in Response over Time in a 7-Day Travel Diary”, Transportation, 13, pp. 163–181. GRAUWIN S., SZELL M., SOBOLEVSKY S., HÖVEL P., SIMINI F., VANHOOF M., SMOREDA Z., BARABASI A.-L., RATTI C. (2015), Identifying the structural discontinuities of human interactions (Physics and Society). HALL C. M. (2003), Tourism and Temporary Mobility: Circulation, Diaspora, Migration, Nomadism, Sojourning, Travel, Transport and Home, paper presented at International Academy for the Study of Tourism Conference. Savonlinna, Finland. HENDERICKX L. (2016), Spatial analysis of long-distance tourism trips in France based on Mobile Phone Data, KU Leuven & Vrije Universiteit Brussel. HOLDEN A. (2016), Environment and Tourism, 3rd ed., London: Routeledge. JANZEN M., VANHOOF M., AXHAUSEN K. W. (2016a), “Estimating Long-Distance Travel Demand with Mobile Phone Billing Data”, in: 16th Swiss Transport Research Conference (STRC 2016), Swiss Transport Research Conference (STRC), p. 17. JANZEN M., VANHOOF M., SMOREDA Z., AXHAUSEN K. W. (2016b), Closer to the total? Long-distance travel of French mobile phone users (No. 1169), Working papers Institute for Transport Planning and Systems. KUUSIK A. (2011), Segmentation of repeat visitors using passive mobile positioning data: customer loyalty based approach, Dissertationes Rerum Oeconomicarum Universitatis Tatuensis. Tartu University Press. SPEK S. VAN DER (2008), “Tracking Technologies: An Overview”, In: SCHAICK J. VAN, SPEK S. VAN DER (Eds. ), Urbanism on Track: Application of Tracking Technologies in Urbanism, Amsterdam: IOS Press, pp. 25–33. VANHOOF M., REIS F., PLÖTZ T., SMOREDA Z. (n.d.), “Assessing the quality of home detection from mobile phone data for official statistics”, Accepted with minor revisions at Journal of Official statistics. VANHOOF M., SCHOORS W., VAN ROMPAEY A., PLÖTZ T., SMOREDA Z. (n.d.), “Correcting Mobility Entropy for Regional Comparison of Individual Movement Patterns”, Accepted with minor revisions at Journal of Urban Technology. WORLD BANK (2013), Abonnés à la téléphonie mobile de 1960 à 2011. WORLD TRAVEL AND TOURISM COUNCIL (2016), Travel & Tourism Economic Impact 2016: France. ZIPF G. K. (1946), “The P1 P2/D hypothesis: On the intercity movement of persons”, American sociological review, pp. 677–686. 1 This is the average of the monthly estimates for the period between May and October 2007 as obtained from the French National Statistics Website (http://www.insee.fr). 2 The Enquête Nationale Transports et Déplacements (ENTD), was collected from April 2007 to April 2008 and most parts are accessible online at (IFSTTAR, 2016). Maarten Vanhoof, Liane Hendrickx, Aare Puussaar, Gert Verstraeten, Thomas Ploetz et Zbigniew Smoreda, « Exploring the use of mobile phone data for domestic tourism trip analysis », Netcom, 31-3/4 | 2017, 335-372. Open Lab, Newcastle University, UK; Département SENSE, Orange Labs, FR. PhD Candidate at Open Lab, Newcastle University, Newcastle upon Tyne, UK and Department SENSE, Orange Labs, Paris, FR. M.Sc. In Geography, M.Sc. in Tourism ; at Division of Geography and Tourism, Department of Earth and Environmental Sciences, University of Leuven (KU Leuven), Leuven, BE. Department of Geography, KU Leuven, BE. Professor; at Division of Geography and Tourism, Department of Earth and Environmental Sciences, University of Leuven (KU Leuven), Leuven, BE. Professor; School of Interactive Computing, Georgia Institute of Technology, Atlanta, GA, USA. Département SENSE, Orange Labs, FR. PhD ; Senior researcher at Department SENSE, Orange Labs, Paris, FR. Address : Orange Gardens, 44 Avenue de la République, 92320 Châtillon, France.